The Buddy Files have been one of the most popular beginning chapter book series at my library, in book clubs and for recommendations. So I was interested, if a little skeptical, when I saw they were doing a younger series with some similar characters. A lot of chapter book series like Judy Moody, Hank Zipzer, Humprey, and others have been translated to younger chapter books or easy readers with varying success. The main problem is often that they don't stand alone - you have to be familiar with the characters already to be interested in reading them. I found this series to stand alone perfectly. King, a golden retriever, enjoys solving mysteries with his human Kayla. If only she could understand him! He tries to teach her a new trick (giving a dog cheese!) but no luck. When Kayla receives a mysterious note, King knows just how to solve the mystery. But will Kayla understand the answer? 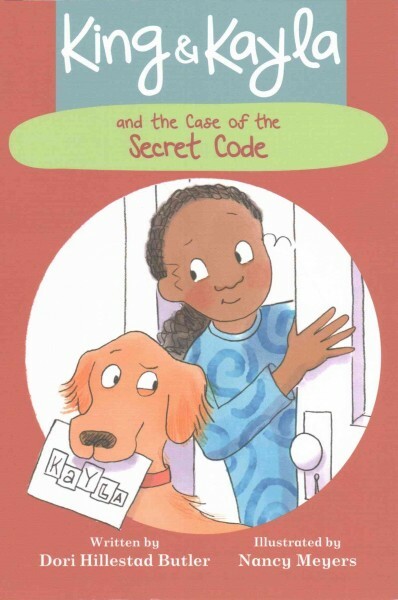 Or will she and her friend have to solve the code the hard way? Meyers' pictures show a diverse cast of kids, led by dark-skinned Kayla, and a humorous and smart dog with adorably floppy ears. It's just the right amount of illustrations for an easy reader and has a friendly, hand-drawn flavor. The simple text fits is just right for an intermediate reader who hasn't yet graduated to chapter books. There's a gentle flavor of humor and a simple but fun mystery to resolve, neither of which take away from the mechanics of reading. 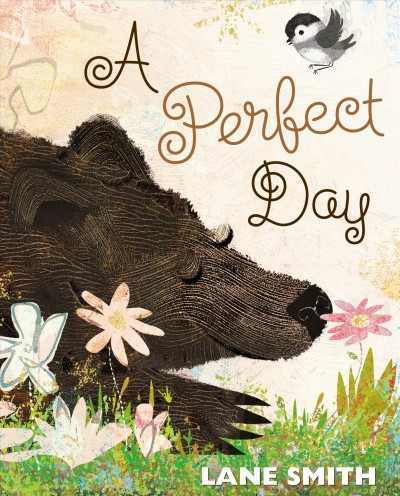 Verdict: This delightful new series has everything I've been looking for - good reading level for intermediate readers, diverse characters who take a main role, animals, humor, and a mystery. Patrons seem to agree with me as the first two books have been flying off the shelves and kids are waiting eagerly for the next installments! I look forward to using these in book club next year and introducing kids to King's earlier adventures and then his later mysteries as Buddy. I hadn't ever thought to pair these two creators together, but the result is quite delightful. McMullan, author of a popular series of truck and dinosaur books (I Stink; I'm Bad; I'm Dirty) pairs with Tao Nyeu, author and illustrator of quirky picture books (Bunny Days, Squid and Octopus, and Wonder Bear). The result is different from what both of them have previously done but it works very well. 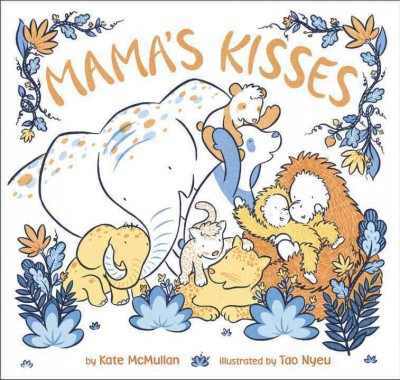 Four mamas, a panda bear, elephant, orangutan, and leopard, are looking for their errant offspring. The little ones have no intention of giving in to bedtime this early though and they lead their mothers on a lively search through the jungle. The little ones hide under leaves, play silly games, and giggle while their mothers look for them in sweet, lilting rhymes: "Come now, my trunkling,/My dear big-eared dumpling,/Tomorrow you'll run,/You'll trumpet and spray." When they finally catch up to the naughty ones, there are kisses and cuddles all around as the babies drift off to sleep. Nyeu likes simple color schemes, usually involving blues, oranges, and greens. This story is shaded heavily in blue with orange and yellow animals and highlights picked out against the soft, soothing background. The grainy textures of her colored pencil art blend beautifully with the sharp, black outlines of each individual leaf, plant, and animal. Verdict: A lovely addition to bedtime stories, this will quickly become a new favorite for caregivers reading their little ones to sleep. I love octopuses and I was interested to look at this, but didn't want to purchase it as Dawn titles can be more heavily geared towards school use than what I need for the public library. This is definitely a winner in the octopus book department though! Simple text, which heavily uses active language "Whoosh! Octopus releases her secret weapon - a cloud of dark ink. She scoots away, still hungry." is paired with chunks of smaller text that offer more information. Colorful collage illustrations are a bit too reminiscient of Steve Jenkins for my taste, but are perfectly serviceable for the text. Like all Dawn titles, this has copious back matter, basically offering lesson plans for teachers or parents, activities, further information, and more. 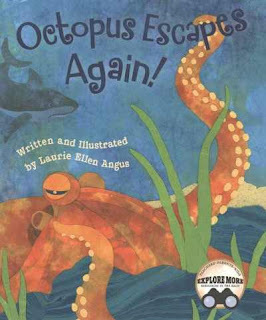 Verdict: If you're looking for more octopus books for young cephalopod fans, planning an octopus-themed storytime, collecting resources for teachers, or setting up science projects, this is a great supplementary title to add to your collection. Pug lives with his best friend, the aristocratic Lady Miranda. Together, they have many adventures. 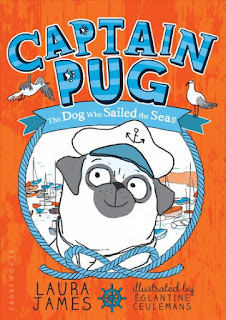 But when Lady Miranda is invited to a party and tells Pug he will be Captain Pug, he is worried. Can he live up to his name? Will he learn to sail the seas? Cheerful orange and blue pictures show a stereotypically British landscape. Lady Miranda is an autocratic and individual little girl, who demands her footmen dress in wigs and tailcoats and carry her in a sedan chair. There's no parents in the picture, but a host of dedicated servants. Pug is a cheerful and friendly animal with a simple reaction to anything unnerving - constant barking - and a determination to please his little mistress. Normally, I'd look at this and take it off the list. 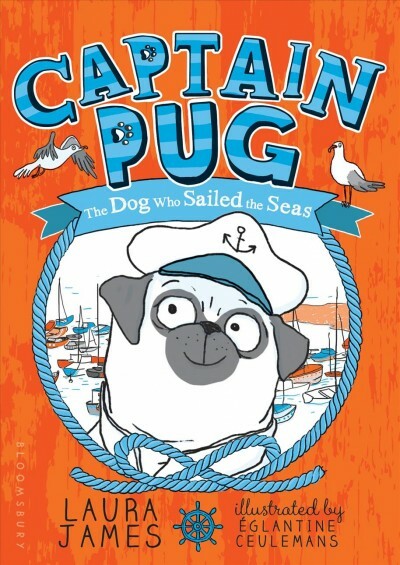 Too British, do we really need more books about wealthy white kids and their pampered pets? Reading level too high for the kids who'd be interested in the story. But I have gotten a lot of interest from parents in reading aloud beginning chapter books with pictures to their younger children who eat up silly adventures with humor, talking animals, and quirky plots. 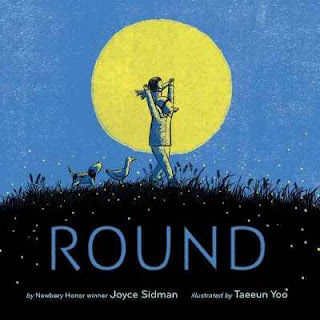 Verdict: If you have an audience for this kind of cozy read-aloud, it's a good addition. I wouldn't purchase it for kids to read on their own though. 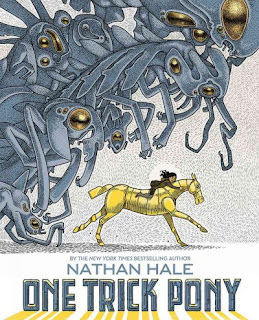 Nathan Hale has taken a brief break from his Hazardous Tales series of nonfiction graphic novels about history to write a post-apocalyptic story of robots and aliens. It's definitely different. At an undesignated time in the future, huge alien creatures called "pipers" have taken over the world. They destroy metal, machines, and especially robots, carving giant circles in the landscapes with their deadly bubbles. Strata and her two friends live in a caravan with the last remaining pieces of tech. They map the pipers, keeping just ahead of them and preserving anything they can find. On an exploring mission in the hills, Strata finds something amazing; a robot horse named Kleidi. It responds only to her and suddenly she and her robot pony are involved in a deadly chase involving pipers, feral barbarians living in the wasteland, and a shocking discovery of the true nature of the pipers. Hale's art is in shades of gray and browns, with dull yellow highlighting the remaining pieces of tech. Kleidi shines a bright gold, symbolizing everything humans have lost and Strata's refusal to give up her hope for the future. The characters show an array of browns and tans in their skin color, as well as different textures and styles of hair. Influences from modern civilization can be seen in jewelry and tech as well as much older civilization in the barbarians' Viking-like attire. This is a complex story, weaving legends of the Pied Piper of Hamelin, post-apocalyptic tropes, and reflections on the nature of humanity and civilization. It's also an action-packed adventure as Strata and Kleidi keep one step ahead of the dreaded pipers. In the end, the story is resolved quickly in a way that left me with more questions; although Strata and Kleidi destroy the monstrous beings behind the pipers, how do they know more won't appear? It seems unbelievable that they were the first to ever discover the secret, although the collapse of civilization would have drastically cut down on communications. Is it really possible for one small caravan of people and handfuls of slow-witted barbarians to truly restore modern civilization? It definitely raises many questions in readers' minds. Verdict: The art doesn't immediately grab the eye, especially in these days of vibrant color, but with some additional booktalking I think this will make an excellent book club choice and a thought-provoking read. I might recommend it to fans of Doug TenNapel, although it's quite a unique creation. 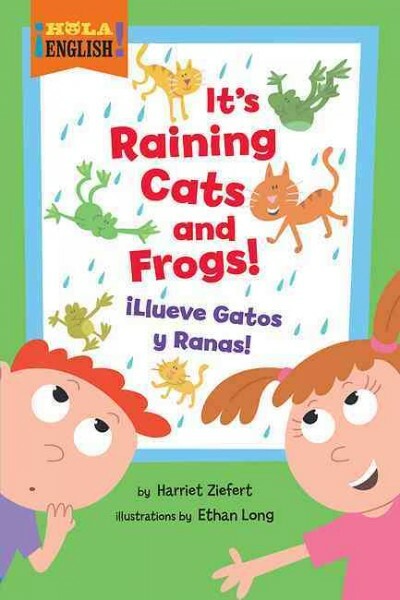 This bilingual easy reader series is a new one for me, although it's apparently been around for a few years. The story of this particular title is simple and silly. On a rainy day two kids looking out a window decide to go outside, even though it's raining cats and dogs and frogs! They'll have to choose the right clothes and then the right outside activities in the rain. Back inside, it's time for reading while they wait for their things to dry. Each page has a simple sentence or two, "Are we ready to go out on this rainy, rainy day?" repeated in Spanish. The pictures are bright and colorful, with Long's trademark minimalist humor. The back cover of the book has 36 words in English and Spanish that readers can learn in the book. The text is a little smaller than I usually like in an easy reader and I'd put it at about a level 2, since it has more complex words, but otherwise this is a series I'm very intrigued to discover. It strikes me as more than just English translated into Spanish, rather it's directed at both English and Spanish speakers, as well as bilingual readers. I can't speak to the accuracy of the Spanish, since I don't speak or read Spanish, but I assume it's on the same level as the English. Verdict: This series will fill a niche in my library, both in offering easy readers for bilingual and Spanish readers and in offering lower level easy readers for my English speakers as well. I plan to purchase some. The little boy from Snow returns in another story of weather and imagination. As the rain falls, the little boy imagines all the things he could be doing outside; playing in puddles, sailing across the water, going on adventures. But Grandpa keeps saying "Let's wait for the rain to stop." The little boy imagines more and more exciting adventures as the water rises until finally Grandpa says it's time to go out and mail a letter. Then the party begins amidst rain drops, boats, clowns, and mailboxes. Back home with towels and hot drinks, the two agree that "the very best things are always worth waiting for." Gentle colors and playful toys and costumes decorate the pages as the story shifts between gloomy outdoor scenes of downpours and the cozy inside of the house. The quiet affection between grandparent and grandchild is portrayed with warmth and feeling, as is the little boy's impatience to get outside. Once they venture forth, the scenes take on an imaginative quality as costumed actors cavort among gondolas, escorting the two on their adventure to mail a letter. 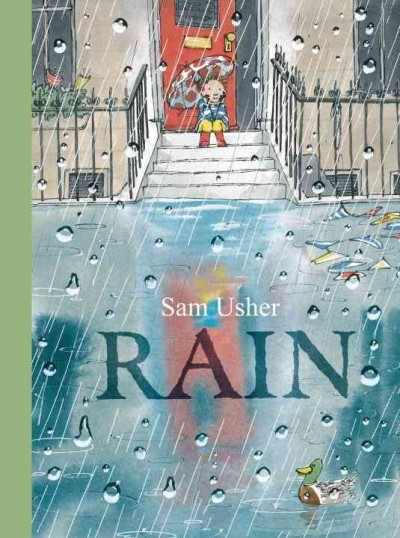 This cheerful story is a sweet addition to rainy-day books. The jump between watching the rain and apparently riding through the floods in partying gondolas was a little odd, but then I'm pretty literal and would like it spelled out whether or not this was a flood, were emergency personnel called, and where the clowns came from. Or is it all in the little boy's imagination? Verdict: The repetition makes this a nice candidate for storytimes and preschoolers will enjoy speculating on whether the flood is real or imagined. I keep looking at the 900s and then shying away. What do I get rid of? What do I add? Where do I get the money for new sets? Do I even need new sets? Does anybody even read the 900s? Well, yes. Mostly the kids want books about war and Who Was... biographies. I gratefully seized on some review copies sent me from Capstone to get me started in this section. 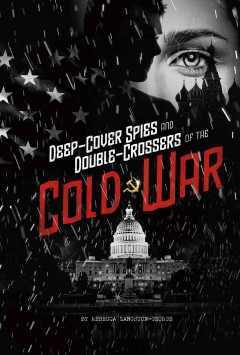 From the "Spies" series, which includes four titles covering World War I, World War II, the Cold War, and modern times, I previewed Deep-Cover Spies and Double-Crossers of the Cold War. The book opens with a brief explanation of the Cold War then looks at five spies who operated during the Cold War; Gary Powers, an American spy who was eventually exchanged for a Russian spy and returned to America and the complicated story of the Rosenbergs. George Blake, a hero of World War II who was imprisoned during the Korean War and voluntarily became a double agent, and Janet Chisholm, wife of a British diplomat and agent who became involved in spying while in Moscow. Finally, the only non-Western person featured, Pham Xuan An, who had a complex relationship with the Western world where he was educated and earned the respect of both sides for his journalistic integrity. In addition to the main text covering the activities of the people featured, there are also photographs of primary documents and people, additional facts, while back matter includes a timeline, glossary, and a few titles for additional reading. There are also questions that tie into "critical thinking" for the common core, source notes, bibliography, and index. Although I would have liked to see more perspectives from people who were not white males, this is a good coverage of a complicated topic. It includes exciting stories, descriptions of codes and spy equipment, breathtaking escapes, and all the thrilling adventures kids look for in war stories. It also includes thoughtful examinations of the motives of the various people involved and how events are viewed differently after the fact, like the case of the Rosenbergs. Verdict: This is a good, basic series on a popular topic. It includes both familiar, mainstream stories and some lesser-known events and people. Librarians will be pleased to know that it's available in paperback as well as library bound editions. I've found Capstone's paperbacks to be very sturdy. A good choice for filling in your 900s. This week at the library; or, Now it's hot. Nope, make that cold. Book about Native Americans for preschool (another high school project). Got them to go with Rabbit's Snow Dance. Finished all the Flying Beaver Brothers. Suggested Kevin Sherry's Yeti Files. "sequel" for Natasha Preston's Cellar. Settled on "Cabin" which we had to request. I survived read-alikes - got to hand out my new I Survived bookmark! The middle school book to movie at your lexile project reared its head again. This is a tough one. Dexter has great dreams of being a super skate-boarding spy. Sadly, they're just that - dreams. He doesn't even own a skateboard. But when his wacky teacher, worried that his farting rats will be taken away, makes a big mistake in trusting a mysterious villain, events start happening fast. 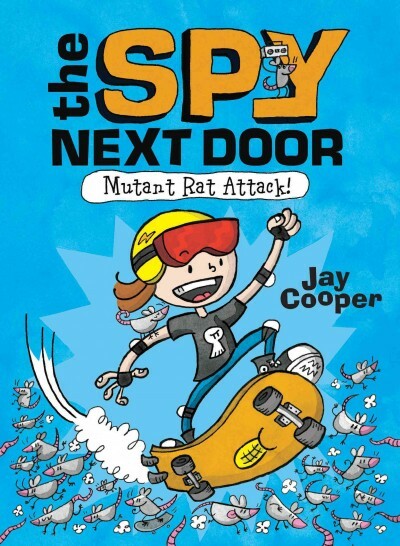 Next thing he knows, Dexter has been inducted into a super secret spy society, given a skateboard with artificial intelligence, and is risking life and limb (not to mention his olfactory senses) in the pursuit of the gaseous Princess, a rat who has been enlarged by bionic broccoli. If this sounds a little too silly for you, you are not the right audience for this book. If, however, you immediately wanted to know why the teacher was keeping hundreds of farting rats and the explanation "to harness the electricity of their gas" makes perfect sense, then this is probably the book for you. Also, there's a good chance you might be a nine year old kid who's also a big fan of Captain Underpants. This quirky little book, first in a series of course, has plenty of black and white illustrations and cartoons. It's full of skateboarding rats, secret gadgets, and a rather snarky skateboard. I am disappointed that the main character is a white boy - there was plenty of opportunity to add more diversity - but with a story inspired by the author's own love of media it's not surprising. Verdict: Nothing new here, but if your readers can't get enough of silly adventures and gross humor they'll happily pick this one up. Princess Cora is absolutely perfect. Or, at least, she will be once she's been thoroughly trained. Every day she bathes (following the directions of her nurse), studies dull books (as her mother requires), and endlessly skips rope (her father the king thinks a ruler should be strong). Cora desperately wishes for things to be different and to have just a little time to herself. Maybe even a pet, like a dog. But when she asks her parents they say no. So she asks her fairy godmother. But something gets a little confused and instead of a lovely, fluffy dog for a friend, Cora gets a....crocodile. 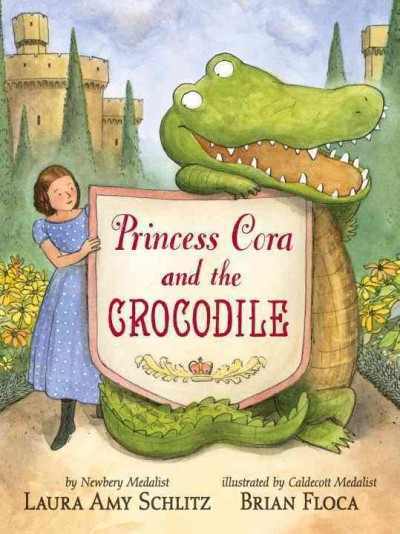 However, she's willing to compromise and the crocodile is certainly willing to help Cora to one day of her own. 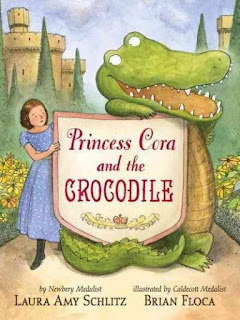 So as Cora experiences her first day of freedom, playing in the orchards and running through the fields, the crocodile takes her place and teachers her nurse and parents some very...sharp lessons. When Cora returns after her day of adventure, things will never be the same! I can see this being promoted as a read-alike for the Princess in Black series, but it's a completely different animal. It reminded me most strongly of E. Nesbit and Eleanor Farjeon's short stories. Floca's delicate watercolors have a gently humorous and old-fashioned look, showing Cora's simple pleasure in her day out and her parents' shock and bewilderment at meeting the naughty crocodile. 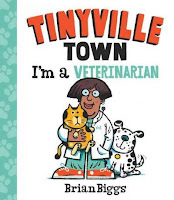 It's also much lengthier; it would work as a read-aloud for patient listeners or a short read for intermediate to older readers, since the vocabulary is more complex than a regular beginning chapter book. Verdict: Delightful and different, this will appeal to parents and children who like a gentle style of humor, light fantasy, and excellent writing. Readers like me, who have a certain amount of nostalgia for old-fashioned fantasy will find this a perfectly cozy evening read as well. I have a strong audience for more classic fiction in my library, so this is a perfect title to promote for the summer. This is the latest in a series of nonfiction readers by Bonnie Bader. Previous titles have mostly focused on the fuzzier side of animals (hamsters, hedgehogs, and sloths) but I was pleased to see the series branching out into less well-known creatures. Each book begins with a reiteration of the title. A close-up of a curious snail, then a side view, then a whole spread of different snails introduces the book. 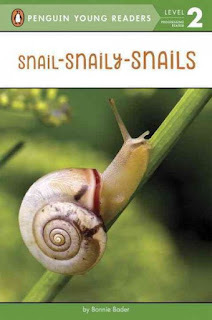 The book continues with a description of different snails, their bodies and shells. It looks at the different places they live, their slime, what they eat, and different types of seeing. The book ends with a cluster of hatching eggs, a comparison of the largest and smallest snails, and a list of the many predators who eat snails (not enough in my humble opinion). The book is illustrated with sharp photographs on white backgrounds and a few underwater and garden scenes. It's a level 2, which for Penguin easy readers puts it at a level E-I and in our library would be marked as intermediate, two steps up from emergent and level 1. Penguin is more accurate in its leveling system than some other publishers and parents and staff appreciate that. The text is bold and simple, with sentences with only a few words and no complex vocabulary, which can be hard to do with nonfiction. Verdict: This is an excellent nonfiction easy reader series and I look forward to seeing more additions to the various animals so far profiled. I looked briefly at this picture book a while ago, but when I received a review copy of the original picture book and three of the accompanying board books I decided to do a longer post, especially as I have a large community program coming up. 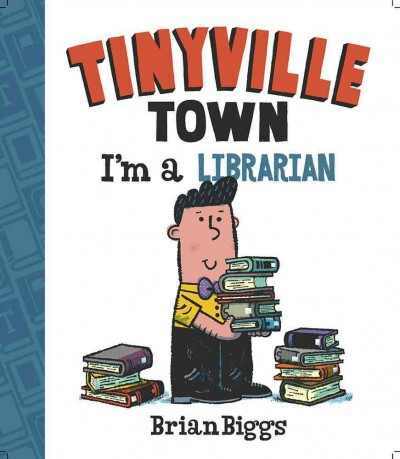 Tinyville Town is a creation of Brian Biggs, a whole world that is caught between the cozy, imaginary ideal of the 1950s and the diverse, tolerant world of the future (well, hopeful future). 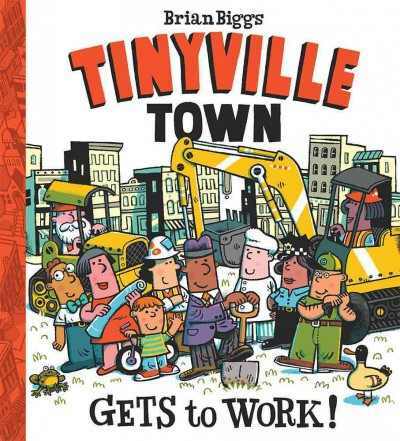 The picture book which introduces Tinyville Town tells the story of a typical day. Everyone is getting ready for work and everyone has a job (no unemployment here). But there's a problem - a traffic jam on the bridge over the river! How will the people get to work. Fortunately, everyone works together for a solution. The mayor meets with the engineer and city planner, the various construction people put the bridge together, and voila, Tinyville Town has a new bridge! 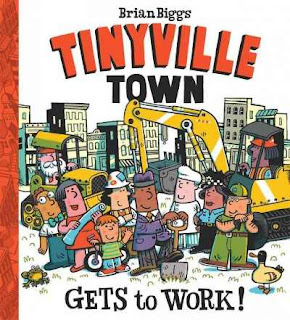 Biggs' cheerful, colorful, chunky pictures show a remarkable diversity of colors and genders, all working hard to keep their city functioning and beautiful.The city is clean and friendly, everyone is smiling and even when there are problems they work together to make things end well. As you might have guessed, I am not a person who really likes or feels comfortable with this utopian-style vision of, well, anything. But I admit that's a personal quirk and for teachers, parents, or librarians looking for titles on how communities work together or construction this is a great choice. 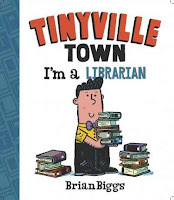 After introducing Tinyville Town, Biggs branched out into a series of board book introducing various community workers. Each title uses simple sentences to describe the day's work of the various people. The veterinarian examines a dog and finds out why his tummy hurts. The firefighter puts out a fire at the bakery. The librarian answers questions, helps people find books, and puts the books away. These titles reflect the same cozy feeling of community as well as diversity; the vet is female and her husband cares for their child, the librarian appears to be gay, the firefighter's crew includes women and people of color. I don't doubt the usefulness of these titles in a classroom setting or program on community helpers (although I suspect that mustache is a safety hazard and I have complicated feelings about the depiction of a male librarian which many of my colleagues share). I'm a little doubtful about these being good board books though. The typical audience for board books is ages 0-2 and these are definitely aimed at a preschool audience. The longer text, more complex pictures, and subject matter of community helpers is too advanced for the average toddler. However, there are plenty of uses for board books with preschoolers and these would make a good addition to a board book collection. Verdict: While I'm not as gung ho about these titles as some of my colleagues are, due to my innate cynicism and some personal feelings about representation, they are certainly standard additions to any library for community helpers units and present a pleasing depiction of a community-minded city with a broad range of diversity. Macy follows up her history of women and bicycles, Wheels of Change, with a new advance in women's liberation - the motor car! The story opens with an introduction from Danica Patrick and Sue Macy, talking about their own experiences as drivers and women. Then the saga of automobiles begins, starting with the first race for motor cars in 1895 (which did not end well). Macy talks about the development of the automobile and the changes it had on women's rights and place in the world from the first electric cars advertised to women to their complete immersion in the driving world in World War II. She addresses early female racers, who were later barred from tracks in Europe and the USA, and the role the automobile played in female suffrage. Throughout the book there are quotations from figures of the day, both for and against women drivers. There are selections from newspapers, accounts from female drivers of their experiences, and timelines and facts showing additional context for the main narrative. There are also copious photographs and graphics. An epilogue talks about how far women have come in the automobile - and how far they still have to go. 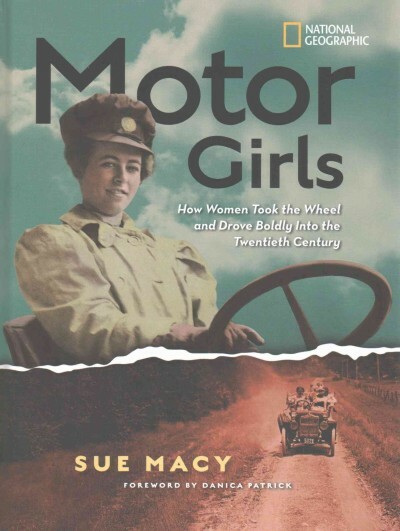 Additional information in the back includes a bibliography of silent films featuring female drivers, additional facts, resources, websites, and museums, sources and credits. Verdict: I was skeptical about the child appeal of Wheels of Change, but this is sure to grab the attention of kids who now accept cars as part of every day life and will willingly plunge into a very different world. Macy's writing is brisk and interesting and the plethora of additional facts will hold readers' attention to the end of the book. Recommended. The exciting news this week is I received a Summer Reading grant from Dollar General! I can now fund my Library on the Go outreach venture. More on that soon! 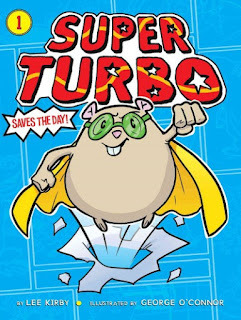 Turbo the hamster is a normal, ordinary class pet. During the day. But at night he comes SUPER TURBO! 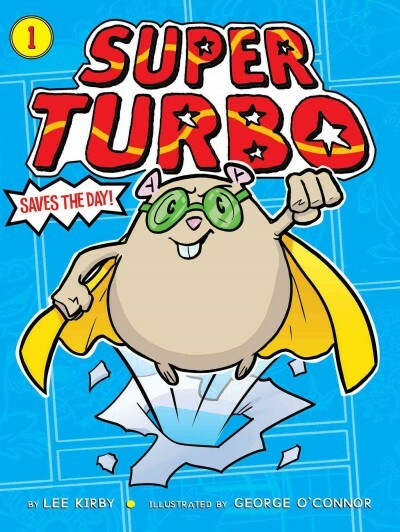 When he runs into some other classroom pets one night, they all discover they have something in common - super powers! While they are searching for evil (and snacks) they run into the maniacal arch-villain, Whiskerface the mou, er, I mean, rat. Totally a rat. Just kind of a small one....and his army of henchmice. Hench rats. Whatever. Can Super Turbo and the other Superpets save the day? This is a graphic blend, so the text is accompanied by occasional chunks of black and white comic panels and lots of black and white drawings. The characters all have unique quirks that makes them easy to differentiate and the action and pace of the panels moves briskly. The dialogue has a pretty small font for a beginning chapter book though. This is a light, humorous story. The text (except for the speech balloons in the comics) is a bold and readable font and it clocks in at 118 pages. It's available in both hardcover and paperback. The pets with super powers trope, combined with the class pets, has been coming out quite frequently so this is nothing new but if you're looking for books to bulk out your beginning reader chapters section this is a nice choice. Cryptozoology is always a popular topic at any library and I was interested to see a sample from a new series from little bee addressing various mythical beasts. The series will eventually include such famous creatures as the Loch Ness Monster, as well as werewolves and zombies, but the review copy I received was for Bigfoot. The book opens with an introduction to the legends and myths of giant creatures, then segues into the contemporary legend of Bigfoot. It discusses sightings and occurrences, scientific evidence (and the lack thereof) and finally presents all the facts for readers to decide - does Bigfoot really exist? 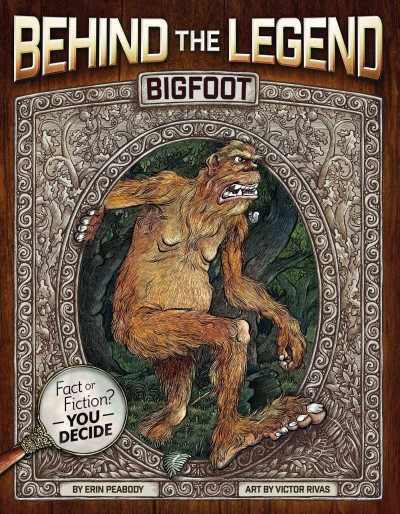 The final chapter concludes that there is no scientific evidence for the existence of Bigfoot, and lists the various theories and their explanations. There's still room for mystery though, as the book encourages readers to weigh the evidence, go on a Bigfoot hunt, and decide for themselves. A few sources are listed as well as further information for those wanting to research Bigfoot online. There are also insets throughout the book with related science facts and investigations. The art in the arc I had was not completed, but it looks like it will be cartoonish with a slightly gruesome/creepy edge. The books are available in both hardcover and paperback. Verdict: For intermediate readers who can't get enough of weird and creepy creatures, this is a nice, intermediate read that encourages scientific methods and examining news and sources. It's a little on the humorous side for True Believers and won't satisfy those who are convinced that these creatures exist, but it's a perfectly acceptable addition to any nonfiction section. Carlos and Carmen are twins and in this easy reader series they have a number of pleasant adventures and silly jokes. In Tio Time the two are excitedly awaiting the arrival of their uncle, Alex. 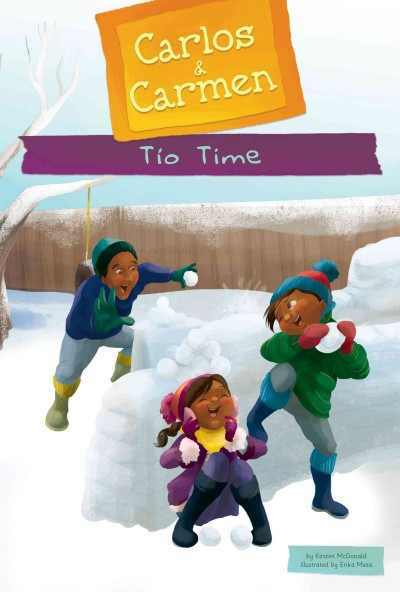 Together the three have an exciting morning of playing in the snow but the twins can't wait for the best part of the day - Tio Alex's mysterious, surprise Mexican recipe! 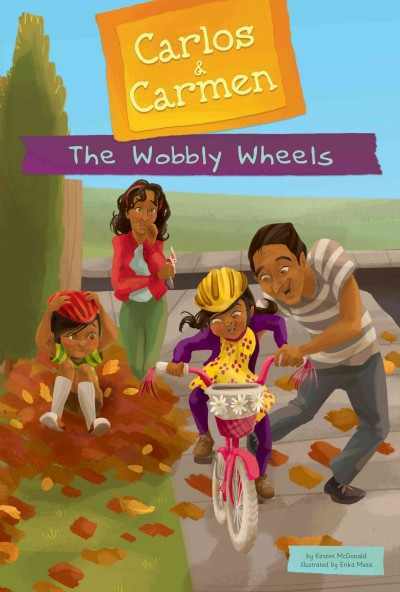 In The Wobbly Wheels Carmen and Carlos are ready to learn to ride their bikes - without training wheels! With Papa's encouragement and Mama standing by with the band-aids, they're soon speeding merrily down the sidewalk. But then Mama remembers there is someone else who needs to learn to ride a bike! They are illustrated with cheerful digital illustrations showing a happy family with brown skin and rosy cheeks in a suburban neighborhood. The text is laid out in full paragraphs and includes dialogue and Spanish (there is a glossary at the end). These are a higher reading level than most of the easy readers I buy - about 2nd grade or higher, with the bilingual aspect added as well. There are four titles so far in this series and they are expensive; $20 apiece in library bound editions (more titles are available in Spanish). The art is pleasant but not outstanding, the stories mildly humorous but not anything particularly earth-shaking. I will absolutely be purchasing these as soon as I have the budget. Why? Because they are the only easy readers I have found that feature a Hispanic family. 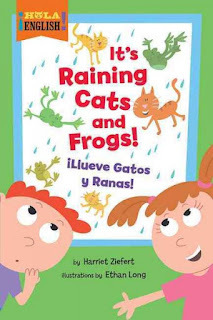 Easy readers tend towards animals and inanimate objects anyways and Hispanic families are depressingly rare in children's books in general so when I find one that is cheerful and fun it goes on the list! Verdict: You need this to fill out the diversity that's lacking in your easy reader section. They are great as fill-in easy readers - the titles kids need to plow through to get their comprehension and fluency levels up - and ABDO has great deals that will make it worth the extra money. Buy them. Before I review this I have to explain that this book was basically written for me. I collect bowls. They have to have the right kind of bowliness though. I love round things. This is a book about the beauty of roundness. Sidman's simple, poetic text celebrates the beauty of circles in the natural world, "I love to see round things grow. Some start out round...like a seed/or an egg, waiting to hatch." Yoo's illustrations really make the book though, showing a small, curious child and her father exploring the world. He's never far away and always ready to listen to her discoveries, but she is allowed to delight in her sense of wonder and find things on her own. Rich greens, glowing yellows, warm oranges, and cool blues swirl across the pages in an explosion of color and delight. This would be perfect for a storytime celebrating nature, round things, or exploring with parents. The book will spark discussion on observation, finding more round things in the world around us, or discovering the things pictured in the book like bubbles, rocks, and sunflowers. Use it to spark art and science projects, or just to curl up for a cozy story in the evening. Bonus points for the depiction of an Asian child and her father, a pairing not often seen in picture books. Verdict: A strong addition to any picture book collection. Highly recommended. I put off reading this for a while because the cover put me off. I can't even really explain why - the muted greens and yellows remind me of 70s artwork? Anyways, I finally picked up a copy for my growing outreach storytime and once I had opened it I fell in love, both with the text and illustrations. Rich, colorful illustrations with sharply defined lines and curving, delicate details set the tone for this guessing game about plants. The pages alternate between full spreads of question and answer and gatefolds hiding the plant. Each page has a rhyming couplet describing seeds, "Soft, hairy./On the prairie." 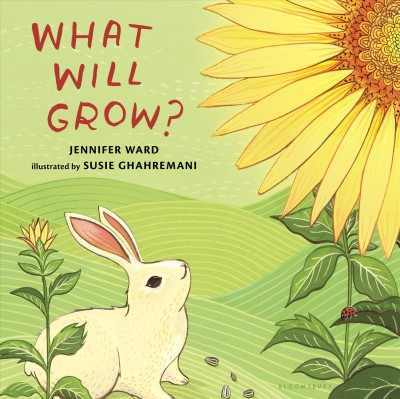 followed by the titular refrain, "What will grow?" and the opposite page shows the plant against its background. "Milkweed" shows fluffy, floating seeds, plants in various stages of bloom, and a ladybug and butterfly tasting the flowers. Pages with gatefolds follow the same theme, but the plant is hidden behind a full-page folding flap. There are four spreads with gatefolds. The "clues" may be too difficult for children (and adults) but there are multiple clues in the illustrations making it easy for a toddler to guess "carrots" or "apples", even if they don't recognize the seeds. Back matter includes planting instructions for each of the seeds listed and an illustration of the progress from seed to plant, as seen in a sunflower. Verdict: There are so many applications for this book for storytime or a lesson with young children about planting, growing, seeds, and more. Discussion points include how the seeds of each plant are scattered, their growing conditions (as seen in the pictures), the animals which use them, and more. A definite must for your collection and for storytime. This week at the library; or, It is not the full moon so why is everything so crazy? Ordered more Stick Dog books. Tom Watson is visiting at the end of May and the kids are eager! We have been having a lot of after school issues and I spent a lot of time having conversations about behavior with teens, the schools, and parents. Not my favorite thing to do. Fortunately we seem to be over the hump and everybody is ready to behave again. New youth services aides hired and scheduled - training will begin in June and again in August. I was disappointed there was no mention of making spaces accessible and welcoming to kids with special needs and their families. This is a long-running, one might even say endless, series that is extremely popular in my library. It's the perfect series for readers who really want to read Rick Riordan but can't handle the content or the reading level. I've never actually read one, but when I decided to use it in book club I had to make a hurried reading the night before! Cronus and the Titans rule the world, Cronus having eaten anyone who could defy them. But one boy remains - ten year old Zeus. He has no idea of his destiny, just wishing that lightning would stop hitting him. When he gets kidnapped by hungry Titans, he decides maybe there are worse things than getting hit by lightning and is almost pleased when he grabs something for defense and it turns out to be a thunderbolt. He's not so pleased when he can't get rid of the thing! Along the way on his adventures he picks up some other ten year olds and together they set out on an adventure. Black and white drawings add humor to this contemporary retelling of the Greek myths. This story is primarily for set-up of the series, so it introduces the characters, setting, and the general mythos. 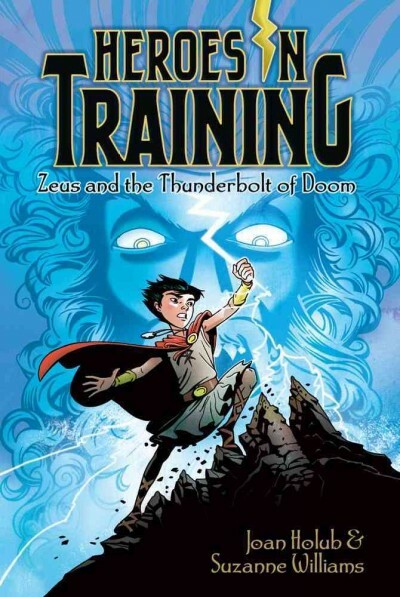 Adults and those familiar with Greek myths will immediately realize that Zeus is the missing Olympian and know pretty much where the story is going, but even if it's not a surprise it's still a well-written and humorous retelling. Verdict: While I hate to recommend starting a series that is coming up on 14 volumes and shows no signs of stopping, you really do need this in your library - it's very popular and fits into a niche. Also, they're funny. Comics Worth Reading recommended this series so I thought I'd give it a try...they were completely delightful! A small and decidedly eccentric girl named Glister lives with her benignly neglectful father in rather tumbledown but completely magical home called Chilblain Hall. Messy black and white illustrations perfectly capture her odd adventures. 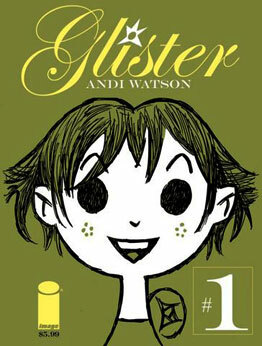 Glister is rarely surprised, almost always cheerful, completely resourceful, and a darling! In her first story, all she's trying to do is make tea...unfortunately, she's gotten a haunted teapot. Like most ghosts, the one inhabiting her unusual crockery has left something unfinished; his novel. At first, Glister thinks it will be fun to finish, but quickly discovers that being secretary to a ghost isn't as easy as she expected. In her second story, Glister is proudly showing off the many unusual features of her beloved home to the head of the Bonny Village task force. Unfortunately, he's not as taken with its many unique...amenities and has some harsh words. Chilblain Hall, deeply hurt, promptly takes off, leaving Glister and her father to make do as best they can. These are exactly the kind of graphic novels I like; funny, quirky, and magical. Will kids like them? The covers are not, in my opinion, particularly eye-catching. Reluctant and unsure readers who are used to straightforward panels in their comics might find the mixture of panels and speech bubbles difficult to follow. The sweet and quirky mixture of the plots won't attract kids who are used to the more mundane realistic graphic novels or fantasy-adventure. But strong readers who like the magical and intelligently humorous will enjoy these. Verdict: I'm still deciding if there's an audience for these at my library, but I plan to buy the whole series for myself. Yum! It's time for the Mother Goose rhymes to go the way of all historical oddities. Keep a few of the best-known ones, sure. Use them now and then in storytime, of course. But dedicate time and effort to teaching your toddler the intricacies of "From Wibbleton to Wobbleton"? I don't see the point. This is yet another Opie/Wells collaboration. This one is meant to enforce numbers through Mother Goose rhymes. It includes "One, Two, Buckle My Shoe", a rhyme about postal deliveries, "Cobbler, cobbler, mend my shoe" (good luck explaining to a toddler what a cobbler and half a crown are), "Sing a song of sixpence", a rhyme about counting chickens, "Hot cross buns" (again, how many toddlers know what a poker, tongs, fire shovel, or hot cross buns are? ), and so on. Some are perfectly decent rhymes - "Baa baa black sheep" but more are obscure or weird and certainly not suited to toddlers. The art varies as well. Dedicated Rosemary Wells fans won't agree with me, but it felt tired and poorly laid out, especially in the smaller details. 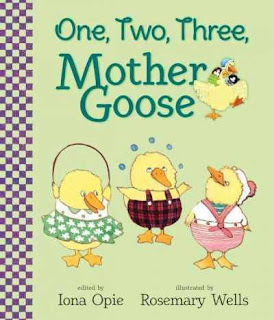 Verdict: I've never been a huge fan of Mother Goose rhymes and this collection is unsuited to the audience and rehashes a lot of tired old rhymes and reworked art. Not recommended. I admit that I'm not part of the Lane Smith fan club. I find his books generally too complex for children - I generally think they're aimed more at adults - and I don't care for his angular, minimal art style. But I keep picking them up because he does elicit interesting responses from people and I keep looking at them to see if something springs up that catches my interest. In this book, something sprung. It's a perfect day for Cat, who is enjoying the flower bed. It's a perfect day for Dog, enjoying the pool. It's a perfect day for Chickadee on the bird feeder and for Squirrel, who has her own cob of corn. Then Bear shows up and the day isn't so perfect anymore - except for Bear! Smith's artwork, which I've often found bland in the past, mixes pastel colors and thick brushstrokes to create an adorably fluffy cat, a colorful flower bed, and all the other creatures who populate the story. The mixture of collage and paint capture the eye and expand the simple text into a simply delightful clash of colors and textures for readers to enjoy. This deceptively simple story will catch readers on a number of levels. 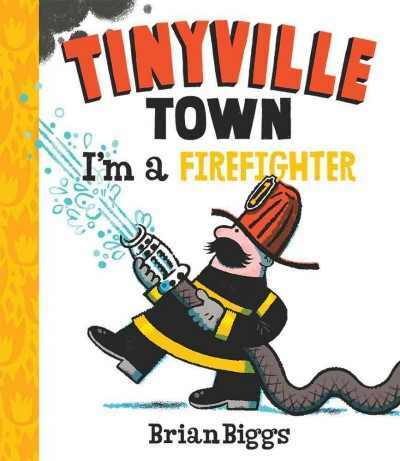 The repeated phrases, building up to a climax and then rolling back down to the humorous conclusion, make this a great story for toddler or preschool storytime. Older readers will enjoy the subtle change in perspective and the humor of the unexpected conclusion. Verdict: This will make a great addition to storytime and your library picture book collection. Recommended. Pogo, an imprint of Jump!, has titles aimed at intermediate readers. Each title includes a message to teachers and parents, encouraging interactive reading and often includes an activity at the end as well. Standard back matter includes a glossary, index, and brief list of further reading. Who eats what is a series of food chains in different biomes and habitats. 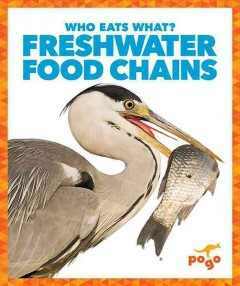 I looked at Freshwater Food Chains and found it difficult to follow. It talks about the different steps on the food chains, the different fauna and flora that fit into it, but then cycles back and forth explaining how different creatures can fit into different places. If you need a wide variety of titles on this subject for school projects it would make a good supplemental text, but it doesn't stand alone in my opinion. Amazing Body Systems tackles a pretty common subject; the human body. 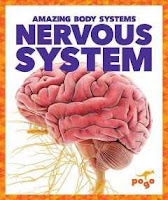 I looked at Nervous System and while it was clear and simple, it didn't bring anything new in layout or subject. It explains the function of the nervous system, physiological details and processes, and how it transmits messages to the brain. There is one rather disturbing picture of what is supposed to be a burn from an iron on the palm of a hand. I mean, it's obviously paint but it's creepy. This would also make a supplemental text if you need a wide number of materials on a specific subject, so this is more suite to a school library, large system, or for curriculum support. Verdict: These series are fine, but they don't stand out from the bulk of series nonfiction. Unless you need more materials in this specific area, I'd pass on these.